Have you ever had one of those days, everything is going along really great. Had a productive morning, got some quality time to do some quilting. I even had a nice lunch with my hubby. Then I made the monumental decision to sit down and relax for an hour. That is when it happened! 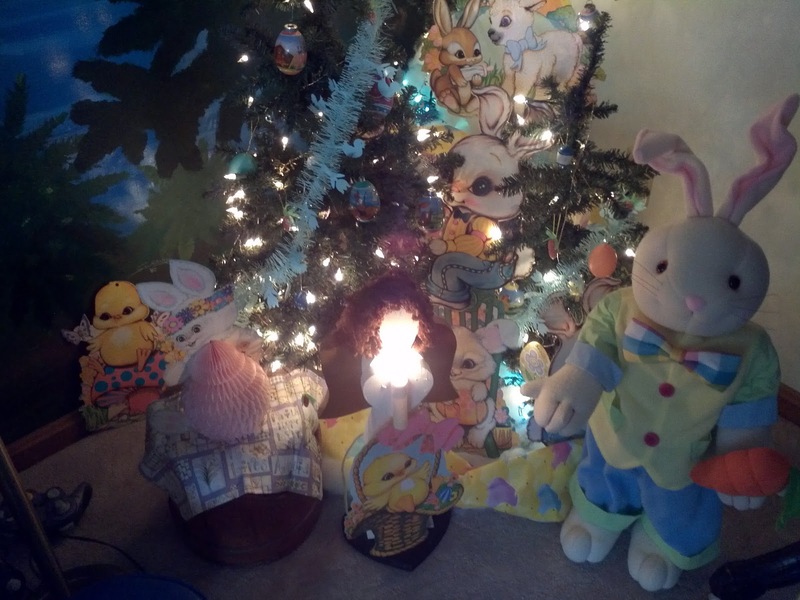 I took down my St. Patrick Holiday trees decorations and redecorated with my Easter stuff. Now understand, for me this is really staying ahead of the game, because for many years, while I was working full time, I had been known to leave my Easter decorations up until the Fourth of July! And I am not kidding. Well, I was feeling good about myself. Oh the hubris! So I continue with my day. My husband had an appointment in town, so he left and when he came back, he had lunch for me. Another triumph for my day. 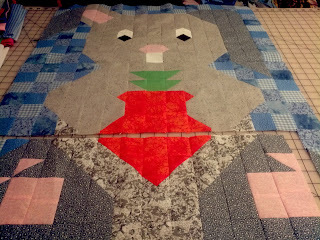 And so I take a break and then go right back to my sewing room and continue piecing my bunny. Right now he looks more like a gopher! Then I made that mistake. Deciding to sit down and enjoy a cup of hot cider, even thought about a little ice cream, (but I didn't!) and then it happened. 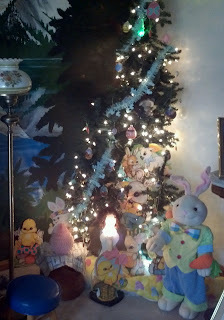 As I was sitting in my recliner, sipping and enjoying, and relaxing I hear POP! and SHHHHSHHH! My English Mastiff, who cannot leave my side even when I go to the bathroom, jumped up and started running around. I jumped out of my chair and ran to the kitchen thinking my spray nozzle on the kitchen sink sprung a leak, but nothing there. Then I ran down the hall to the bathroom and OH MY GOSH! 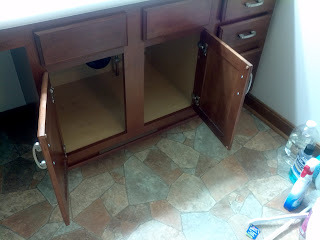 The water line under the sink had broken and water was running everywhere. I grabbed some towels and started pulling cleaners out of the cabinet to get to the shutoff valves. Of course, the first one I turned off wasn't the one with the broken hose, so I tried to turn off the cold water side. You guessed it, it wouldn't budge! Thank goodness my hubby was still down in the basement and I screamed at the top of my voice for him to turn off the main water supply. After a lack of communication for half a minute or so, and about an inch of water later on the bathroom floor, the deluge stopped. And so we mopped, and mopped and after we were all done and called our handy plumber, my hubby informed me he still hadn't got the message I was trying to convey in my screaming mode, but the water coming down on his shoes in the basement got his attention! And so, we mopped some more. The moral of this story is - don't stop quilting to relax. 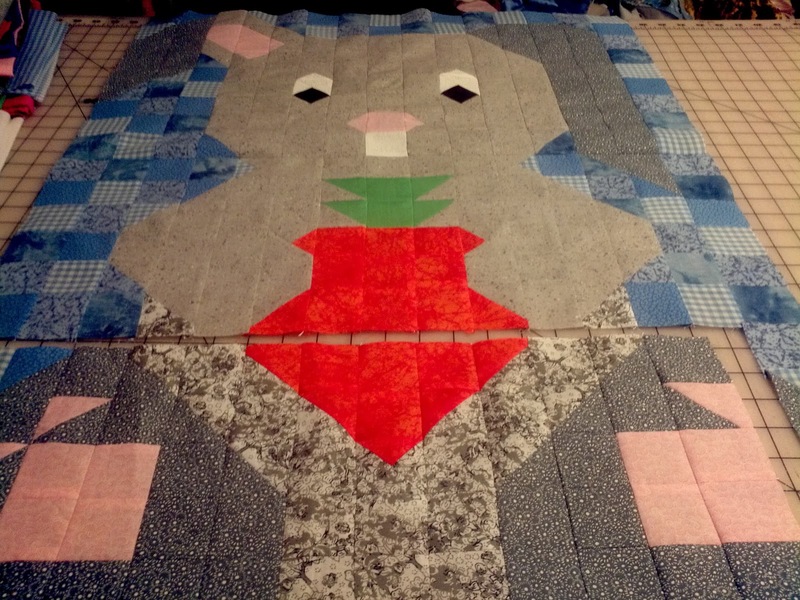 Just keep on happily quilting along and all will be well with the world! This is after the mop up. I didn't think to take a pic of all the water.